I love these days between Christmas and New Year. As someone who loves to stretch the festive season out for as long as possible (yes, I've had my Christmas playlist on since mid-November), I take any excuse to spend yet more time eating leftover turkey, enjoying long strolls in the countryside, and catching up with friends from home over hot chocolate. However the temptation for me - both at this time of year and the rest of the year too - is to pack as much as is humanly possible into these precious days. It's great to make the most of the opportunity to see people, get revision done or make a head start on next term's work, but it's also worth taking the opportunity that the holidays give us to spend time resting. The Bible says that God himself rests: right at the beginning of the Bible in Genesis after He finishes his creation work, God rests (Genesis 2:2-3). And God also designed us to be people who function best when our lives are a combination of work and rest, and He commands us to rest in the 10 Commandments in Exodus 20. 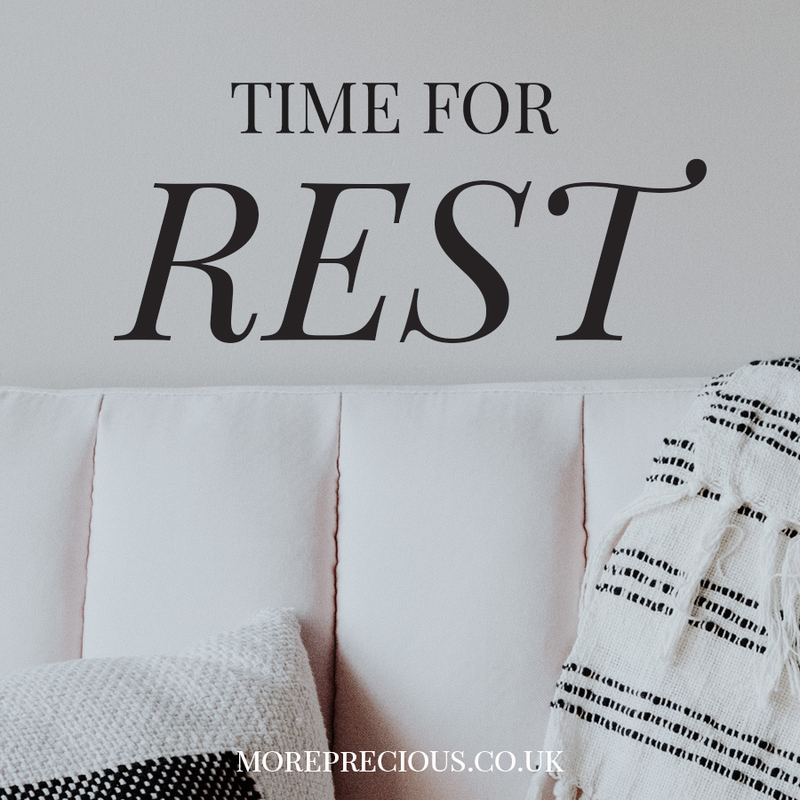 So what does true rest look like, and how can we use this time between Christmas and New Year to rest? There is so much to say on this topic, but below are three quick ideas that have helped me and I hope may help you too. Firstly, let's pray that God would help us delight in regularly finding rest in Him. If spiritual or physical rest is something that you find difficult, pray that He would help you delight in it more. If you find it hard to rest because you become anxious that you're not doing enough work, then let's pray that He would remind you of your true identity, which isn't based on your work. If you find it hard to rest because you find it difficult to say "no" when you're asked to do other things, then pray that your Heavenly Father would show you how He'd have you prioritise and use your time. If you find it hard to rest because you become far too distracted by the things around you (Snapchat, work, Instagram, blogs), then let's pray that God would help us be still, focus, and trust that He is so much greater. Rest is a discipline and something that we learn. So like any other discipline, we need to train our bodies, minds and souls in it. It doesn't just happen automatically or by accident; we have to be intentional in our rest. So this means that we need plan our rest. Actually blocking out time in the diary to rest and prioritising it, can be a good way of making this happen. Even just the physical act of adding 'rest time' into our calendars is a great way of reminding ourselves of the importance of rest. And it also means that when something else crops up - like if someone asks us to do something, or we consider starting on that next piece of homework - we will see that we already have plans for that time: resting. Setting time aside in this way is also a great way of trusting God that His way of living is best, and will help us trust in His plans and purpose for our lives more and more. It reminds us that our identity is not in what we do, but in who we are - dearly loved children of God. So take a look at your week ahead, and why not block out a specific afternoon or an evening or two that is your dedicated rest time. We need to know how we rest, both spiritually and physically. In my opinion, checking Instagram, doing emails in front of the TV or endlessly talking about our work doesn't really count as resting - it's not the same thing. It is ok to do one thing at a time, and to dedicate time to giving your body and soul the rest it needs. How we actually do this in practice will look different for all of us, so we need to start working out what physical and spiritual rest looks likes for ourselves, and it's ok if that looks different to our friends around us. Sometimes, resting physically may include being active - exercising, playing music, reading a book and spending time with people. At other times, the way we rest physically may be by being inactive - taking a nap, chilling on the sofa, watching a film, or spending time away from people to be alone and recharge. Jesus himself spent time away from the crowds who followed him so that he could pray (Luke 5:16). For most of us, a combination of these two approaches can be helpful. And more importantly, we need to get to know how we rest spiritually too. Spiritual rest is about our relationship with God - it's about coming to Him, spending time with Him, because it is He who gives us rest. There are so many ways that we can do this. We can spend time with our Heavenly Father by going for a walk to pray to Him, by lighting a candle and spending time reading His word (longer chunks or just a few verses), by worshiping him in song, and by meeting with friends to pray together. Writing down truths from his word that particularly speak to us or things that we feel God is especially pointing us to can be a great way to help us meditate on His word, and help us remember. So why not use the opportunity we have this week to dedicate time to spend with our Heavenly Father, focusing on Him. Let's praise Him for all of His goodness to us over this last year, and the many blessing we have. And let's give our hopes and fears for 2017 over to Him too. Emma grew up in Bath, before moving to Cambridge as a teenager and staying on to study Law there at university. Since graduating, Emma has worked in the finance industry and is the More Precious Development Manager. Emma is married to Luke, and they go to church at Holy Trinity Brompton in London.